Many people consider December to be the most magical month of the year. I’ve got nothing against Christmas. I like presents. I like turkey. I even like winter in Canada. The cold doesn’t bother me, or the snow (of which we have had essentially none so far this year). What I don’t like about December is all of the activity. As I write this shortly at 7:30 am on Saturday morning, my wife and son #1 have already left for the school Christmas bazaar, where they will sell baked goods and what-nots for the day, to raise money for a student end of the year trip. Son #2 is still in bed, but we have our own activity this afternoon when I take him to a group violin practice, in preparation for a Christmas concert in two weeks. Tomorrow Son #2 and I get to leave the house at 6:30 am so I can take him to meet his team at school to then drive an hour to the University for a student-built-robot competition. Son #2 is 11 years old, so he thinks it’s pretty cool that he gets to go to university for a day. I suspect when I wake him up at 6:00 am on a Sunday he won’t find it quite as cool. Last week was a school play. Next weekend, more concerts. And so it goes. Lots of activity. I’m more of a “keep the activity to a minimum” kind of guy. But that’s just me. Activity after activity seems like a whole lot of “sound and fury”, and in the end, what does it signify? Perhaps nothing. (Of course we all remember that William Faulkner borrowed Shakespeare’s words for his book The Sound and the Fury, a story about the decline of a well-to-do southern family, but I digress). 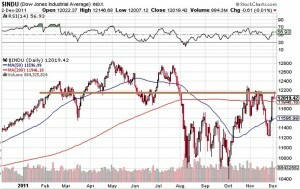 On February 1, 2011 the Dow closed at 12,040.16. 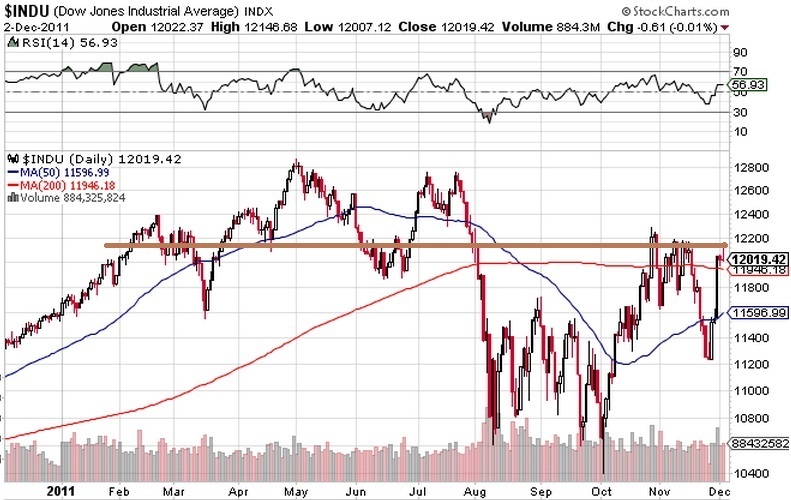 On December 2, 2011 the Dow closed at 12,019.42. That’s 10 months of now action. But of course there was lots of action, lots of volatility during that time period. On April 29 the Dow hit 12,810. On July 22 it was still at 12,681. Then by September 23 it had “crashed” all the way down to 10,771, a “peak to trough” decline of 15%. Then the bounce back up to 12,231 on October 28, a recovery of 13.5%, and that’s approximately where we are today. That’s a whole lot of sound and fury and volatility to get nowhere. But is it fair to say that nothing is happening? Is it fair to say that JDH going to lots of Christmas activities is sound and fury, signifying nothing? No, that’s not fair. From my perspective attending a concert for an hour and a half to hear one of my sons play for three minutes may seem unproductive. But for a young person with limited experience being up in front of a crowd, the experience of practicing, working towards a goal, and then conquering your fears and accomplishing something is, in reality, quite a good thing. You have to look below the surface to see what’s actually happening. 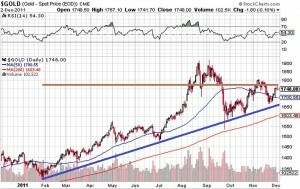 While the Dow has not moved since February, the same statement cannot be made about gold. At the end of January gold was around $1,300 per ounce, the low point for the year. 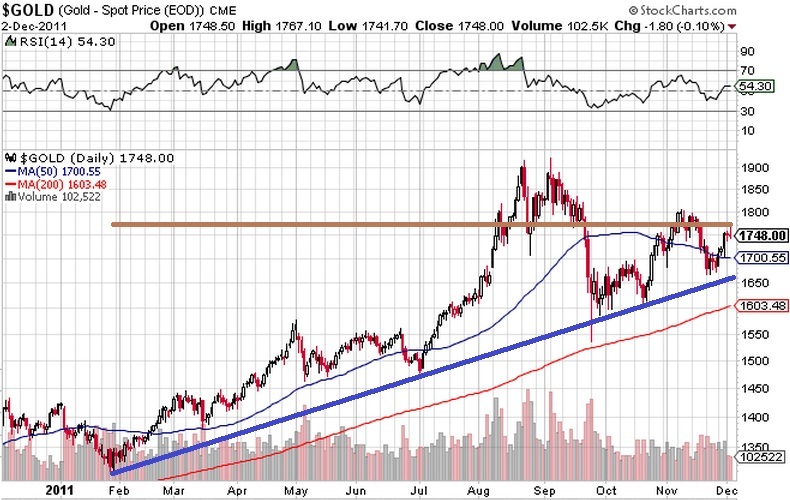 Gold peaked over $1,900 in late August and early September, and despite a “crash” to below $1,600 in September, today gold sits comfortably above all of the trend lines at $1,748, a nice comfortable 34% increase since the end of January. That increase doesn’t “signify nothing”. It signifies the continued debasement of the currency, and it signifies the slow but steady retreat from paper assets to something more tangible. It would be nice if all of my gold and silver stocks were up 34% from the low, but alas that’s not the case. Most are up, but you would expect that with the leverage to the gold price if gold is up 34% the stocks should be a double. They aren’t. But that’s fine. The hockey game is very rarely decided in the first period. If it’s football and if Tim Tebow is playing, the game isn’t decided until the last minute. It takes a lot of patience to sit through a Christmas concert. It takes a lot of patience to sit through a manipulated stock market where the powers that be can manipulate a stock market back up to a nice round number like 12,000, and can work to keep gold under nice round numbers like 1,900 and 1,800. But in the end patience is rewarded. Gold, and the underlying stocks will eventually find their true level. And the Christmas concert will end. This week’s post was awesome. Brilliant how you tied it with the story of your day-to-day, hit the idea home for me.